Wait – before you run out to your local book store to grab a copy – it’s currently only in 1 Coles store! I have a friend who manages the Coles Book Store in Fairview Mall, Toronto asked if we’d like to sell Train of Thought on consignment at his store. We floated it by Michael Mindes at Tasty Minstrel Games to see what he thought. He agreed that it would be a good idea, but to do consignment from the US to Canada was a lot of effort and custom costs. So Sen took it upon himself to order some copies direct from Michael and complete the consignment deal with my friend in Toronto. Sen went in on the weekend and showed the manager the game and how to play it and left a dozen or so copies of the game. The manager said he would try to get a game in with some of the managers from other Coles stores. We’ve had people bugging us about where they could find our game, and some of them have never been to a game store and didn’t even know they existed. Hopefully this deal with Coles will be the first tiny step towards Coles, Chapters, Indigo and even Borders in the US carry the game by the holiday time this year! Location of Coles Book Store that's carrying Train of Thought! 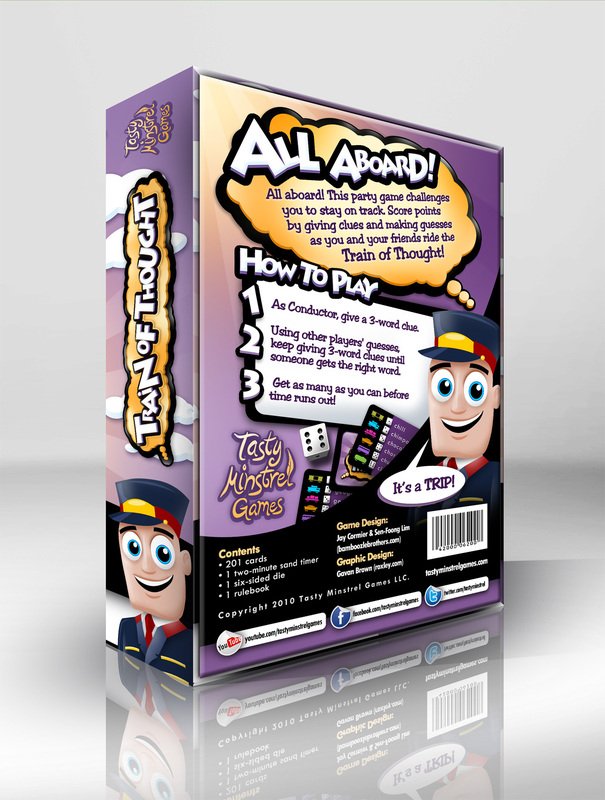 Not to take away any business at all from your friendly, local game store, but Train of Thought is now available on Amazon.com! If you’ve played the game, then head on over and rate the game or give it a brief mini review to let others know that you like it (if you do like it!). Slowly and surely we’ll keep trying to get Train of Thought into more and more locations for sale – either online or in actual stores. We’ve been interviewed by Tom Gurganus from the website Go Forth and Game, and it’s now posted! Go forth and enjoy the interview, in which we talk about why we’re called Bamboozle Brothers, the inspiration for Train of Thought and Belfort and also talk about some games in our future! Thanks Tom for a great interview! You can read the interview here! 2) if someone does indeed steal your idea – then it’s just going to be a nuisance to sue them. How much is that nuisance worth to you? Seems harsh a bit – but the good news is that there aren’t many examples of people stealing other people’s ideas for games (I actually don’t know of one). Publishers really don’t do it – because it’s a small industry and they wouldn’t want that kind of reputation. People don’t do it because if they stole your idea then they’d just be in the exact same position that you are in now: the “I’ve got an idea…now what?” stage. Most people don’t have a clue on how to take that next step. Let’s dissect the differences between the copyrights, trademarks and patents and which ones we need to be concerned with as a board game designer. It should be stated that I’m no lawyer, so this is meant as just observations from my experience. Basically, copyrights protect intellectual property like a book or a board game. It does not protect ideas, facts, systems or methods of operation. This is how trivia games are able to exist and not be sued. Where you could get into an issue with copyrights and games is if your game uses actual text/dialogue from something else. You might get lucky if you only use a small amount, but I wouldn’t risk it. If you are preventing a company from making a game off their own property then you are in trouble! Obviously you can’t make a board game based off of a popular TV show without a signed contract beforehand – but you can get away with trivia, as long as it’s not a trivia game based just on that one property. You couldn’t make a Simpsons Trivia game without a signed contract, for example. Pretty much just the rulebook is protected. You can’t protect the mechanics or systems at all in your game. Someone could make an almost identical game to yours, and as long as they redo the entire rulebook, then there would be nothing you could do. That said, who would go through that much effort and cost to make a game that is too similar to something else that’s already available? Sure there are many instances of novel mechanics being borrowed/stolen from one game to another, but that happens in any medium. Just make it. There you go – it’s automatically protected! As soon as something is created it is protected. Now you can register for an actual copyright, but it’s never usually recommended. It would only be part of a lawsuit were one to arise from some sort of infringement – and a very minor part. I haven’t heard of game designers getting their own work protected by an official copyright before. We don’t. If you are the legal author, then you are allowed to use the © symbol if you want, though it doesn’t help or hurt you for having or not having it on your work! A trademark protects words, phrases, symbols or designs that identify a brand and help distinguish it from another. You couldn’t design a game and call it Monopoly, for example, or open a restaurant that had golden arches. If you’re just in prototype phase, you could trademark your logo or a saying/slogan that goes with your game. 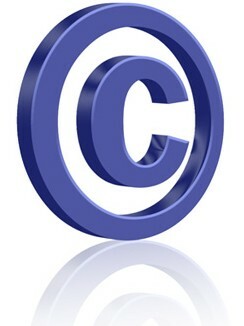 Similar to copyrights, your work is trademarked as soon as it’s created. Feel free to put the TM after a logo to prove that you’re the legal owner of the rights to that logo. We have never done this for our prototypes – and I don’t see it very often on finished products either. When you see an R after a logo, that stands for Registered Trademark and is often used for big companies. If you’re looking to self-publish, then it might be worthwhile to prove to the public that it is indeed your property. It seems like the only time you see the © or TM is from a paranoid person who has a fear that his or her idea will be stolen. Now you can get away with a lot if you’re framing it up as a parody. If you’re using a logo that kind of looks like a popular TV show, but is making fun of it – then you’re ok. Mad magazine gets away with this all the time. Parody can be a fine line though, so you might want to get more professional counsel if you’re unsure. This is an apparatus for sure, but I dont think I want to play this game! A patent will protect an invention or discovery. Patents for board games only make sense when you have invented a new mechanism that hasn’t been seen before. I’m not talking about a new game mechanic, like a new way to do card drafting, but an actual physical mechanism or apparatus that does something in your game. 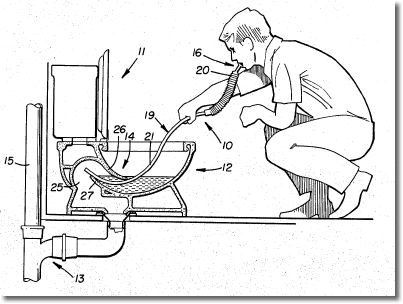 We have never had to patent any of our ideas as there was never an invention of a physical apparatus in any of our games. Anyone who tells you that you should patent your board game before sending it to a publisher – and your game has no new physical mechanisms to it – then they are overly paranoid, ignorant of the process, or stand to make a buck from it somehow! The best advice I can give is to not worry at all about it. I’d also say that you shouldn’t put all your eggs in one basket though. If you enjoy game design – then work on a few more, just in case. Steven Sondheim – one of the greatest musical composers of all time – was apprenticing under Hammerstein (of Rogers and Hammerstein) and Hammerstein asked him to write a musical. Sondheim spent 9 months and finally handed in his first musical. Hammerstein took it and threw it in the fire and said, “Thanks, now write another one.” Sondheim was devastated but eventually wrote another one. After this happened 4 times to him – Hammerstein finally said, “OK now you’re ready – write a musical.” And then he wrote the Tony Award-winning Company. We recently had a game signed by a publisher to be published but then a game was announced to come out around the same time – and the description of that game made it sound ridiculously similar to our game. We did show off our game to people when we were at BGG.con in November – so there’s a chance that someone saw it there. But as disappointing as that is – we’re not suing or anything…we’re just moving onto our next project. And this was a game that was signed to be published! But it can’t be proven that they stole this idea. In fact – if anything we could be accused of stealing a portion of their game since a version of their game existed a long time ago (though we weren’t aware of it, we swear!). Let me know though if you’ve had any experiences with any of these three things when it comes to board games. While I hope no one has ever gotten the short end of the stick, I would like to hear about the other side of the coin to see if our experiences so far have been normal or atypically lucky! We’re starting the promotional campaign for Belfort! The artist for the game, Josh Cappel, has made up these small ads that take one of the components of the game and then has a interesting or funny saying attached to it. We’re expecting a new one to be posted every week until the game launches this summer! 1) Register on www.boardgamegeek.com and then subscribe to Belfort (an option on the right hand side of the screen). 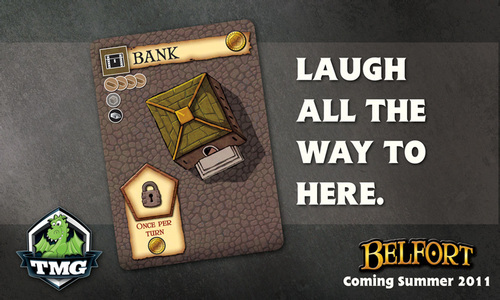 Then, every time you log into boardgamegeek.com you will be told if there has been any updates with Belfort! 2) Go to Facebook and add Belfort as a friend! We’ll be sharing the images on Facebook shortly after they launch on boardgamegeek.com. If you’re interested in helping out, then you can click the green ‘thumbs-up’ icon near the image when you’re on boardgamegeek.com. If enough people ‘thumb’ it then the picture gets promoted to the front page of boardgamegeek.com. This helps with awareness of the game even more! The Euro Game market is a crowded scene, so anything we can do to stand out we’ll try it! Here’s the link to the first image. I’ve included the first image in this post – but head on over to boardgamegeek.com and give it a thumb (and yes, you do have to register once in order to thumb – but I’ll be asking you to thumb and rate more of our games in the future – so you might as well register now! Hey – while you’re there, why not write up a quick review of Train of Thought – or at least give it a rating? I’m not asking for you to stuff the ballots – but just for you to rate it whatever you think it’s worth!). Two friends of mine, Xavier and Matt, gave me a really cool birthday present. 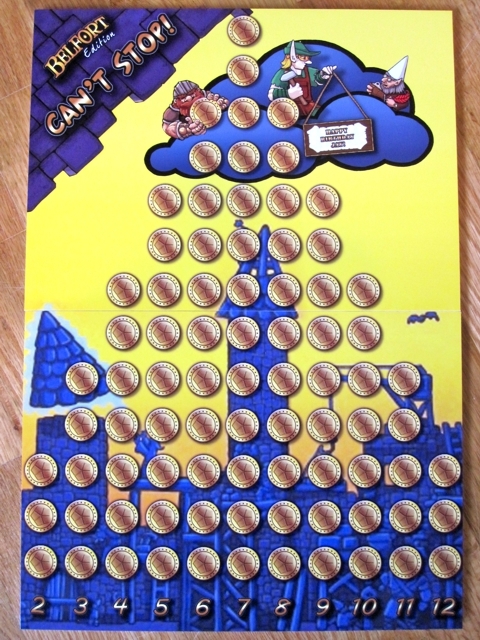 They saw that I had the game Can’t Stop on my Want List on boardgamegeek.com, so Xavier took some of the available artwork from Belfort and made a totally unofficial Belfort edition of Can’t Stop! I love it! Thanks guys! If you haven’t played Can’t Stop, it is a game I recommend. It’s definitely a filler game and pretty much defines the “press-your-luck” category of games. This will tide me over nicely until we get Belfort back from the printers in China. We’re expecting the game to hit the stores this summer, and are planning a marketing buildup on boardgamegeek in the next few weeks, so be on the lookout for that! Looks like a fellow reader enjoyed reading our blog so much that he wanted to share it with other Spanish speaking friends. Javier Garcia translated all the Steps to Publication we’ve posted here into Spanish. So if you’ve got some game design friends that are more comfortable reading Spanish, then let them know about this link! Having fully moved into my new home, I’ll be back to a more steady stream of posts on this blog. First up is an announcement for those that live near Vancouver, BC or London, ON. I will be hosting a Demo Day to showcase Train of Thought at Connection Game store on Saturday, April 16th from 1pm to 4pm. I’ll be showing people how to play the game and one lucky person will win a signed copy of the game. Meanwhile, Sen will be in London at the Toy Shoppe on the exact same day (Saturday, April 16th) between 10am and 4pm doing the exact same thing! Truly a coincidence that we’re both doing Demo Days on the exact same day! 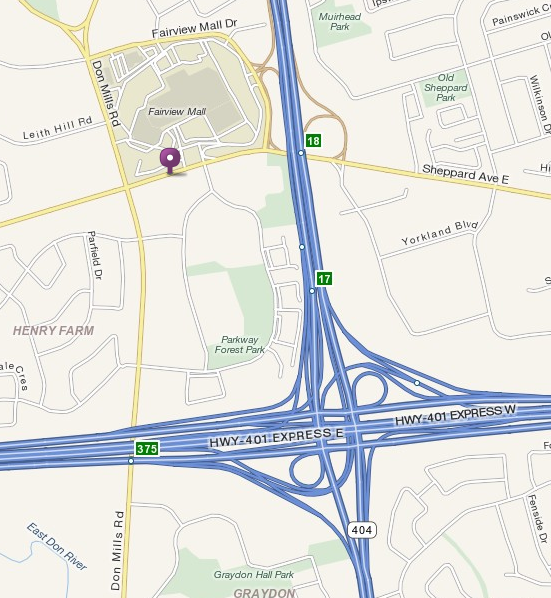 So if you’ve been wanting to try the game – or even meet one of the designers, and you live within driving distance (unless you want to fly in to meet us! 🙂 ), then please stop in and say hi and check out Train of Thought!